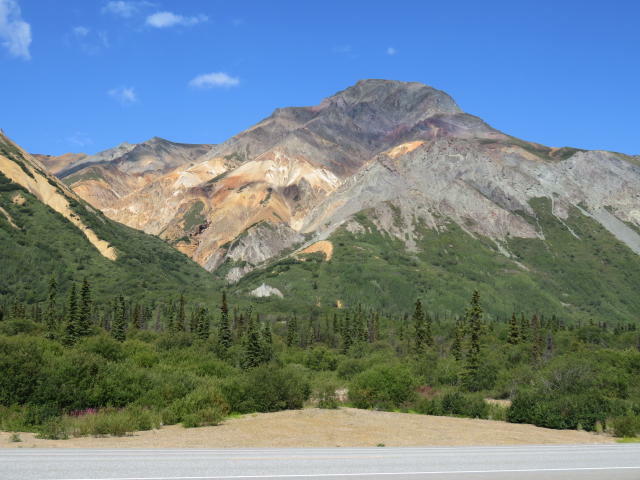 As we completed our trip across the Glenn Highway, we came upon a short stretch of construction in which we received our "Alaskan Medallion”, a stone chip in the windshield. 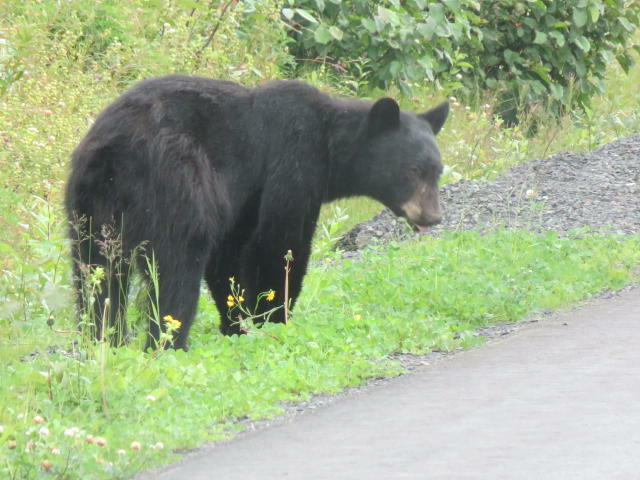 It is commonly said that you will receive a stone chip, while travelling in Alaska. Try as you will, when driving in these gravelled sections, to stay far enough behind the vehicle in front in hopes of avoiding an errant stone, you cannot avoid a stone thrown from a passing vehicle going the other direction. A pickup truck towing a utility trailer, passed us going too fast and sent a stone flying. So there it was, a dime-sized mark, a couple of feet up from the bottom and a foot in from the side. Later that morning, we drove through a 34 km (21 mile) section of construction. The dust was incredible! You had to stay back from the vehicle ahead or you could not see. We drove on washboard sections so rough that the steering wheel shook violently. It was so rough that it was hard to hold onto the steering wheel unless we drove at a walking pace. It did not matter where you went on the road, the washboard persisted sometimes up to a mile in length. 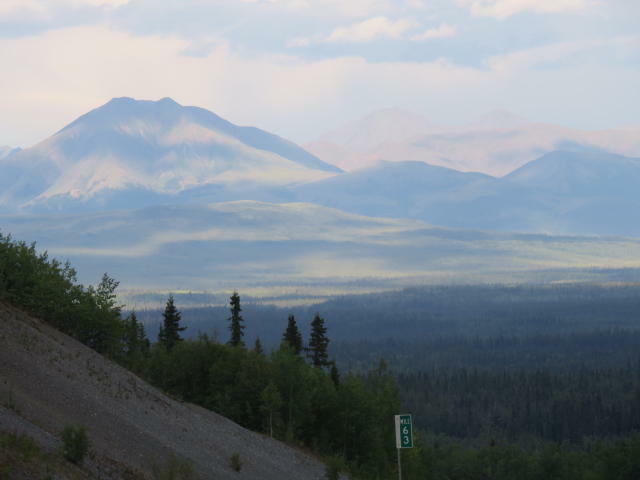 So with driving slow, seeing incredible dust and knowing that Alaskan roads were supposed to be better than the Alaskan-Alcan Highway we were to rejoin by day’s end, we were apprehensive. After a lunch break, we continued on our trek up the Tok Cut-off. We stopped for an afternoon snooze in a pullout, and about an hour later, we started again. As soon as the engine came to life, we immediately heard an alarm tone and noticed a "Check Engine Light” on the dash display. I turned off the engine, checked the fluids to find all OK and restarted, only to have the alarm and light still on. Depressing a button turned off the alarm and cleared the display and we set off again waiting to see what showed up. Just before dinner time we came over a small crest in the road and immediately ran over a section of loose gravel and lots of tar. Two black tracks were visible as far ahead as we could see, so we knew this tar was fresh. In the repair areas along the highway, many of which we had already crossed, they ‘fix’ the road heave, spread gravel, spray tar and then spread a covering layer of gravel. It appeared that on this repair they did not put down the covering gravel layer. 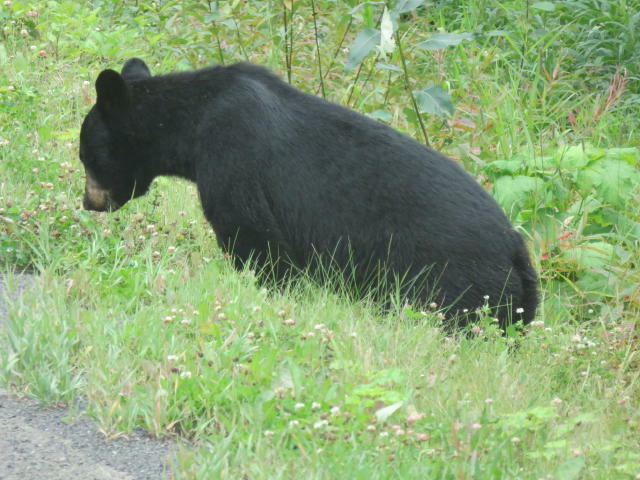 At our dinner stop, we looked to see what the outcome of all that tar crossing was. The coach had a little bit of tar behind the wheels on the body, the mud flaps had caught the majority. There was some on the rear panel, strangely it seemed, higher up on back. The white Vue that we were towing was BLACK! Tar covered the complete front end, a section of the hood both sides from roof to bottom, the rear hatch and window and even some spots on the roof. What a MESS! Thankfully, even on this restart the Check Engine light did not come on. 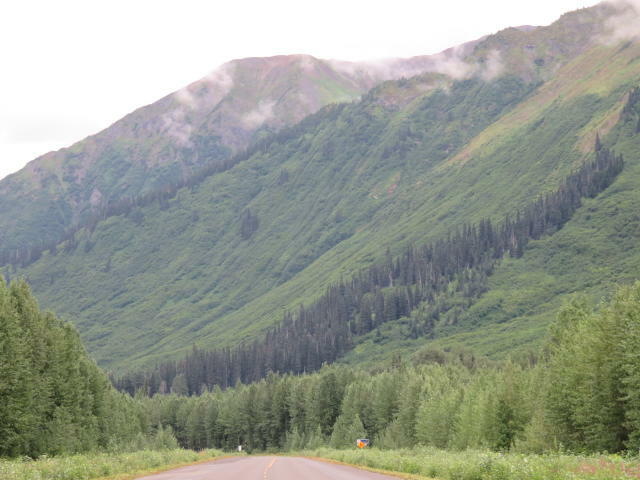 We drove to Tok, Alaska, our destination and looked at the car again. We had planned to put on our car cover in Tok in anticipation of the drive on the Alaskan (Al-Can) Highway. It covers the complete front of the car from the lowest front section up to the top of the windshield and both front fenders. This cover provides great protection against stones and grit damage for our tow car and we knew it should be put on while completing the remainder of the Alaskan highway we had skipped when we travelled up to Dawson City, YT and over to Chicken, AK on the Klondike Loop. However, there was far too much tar, putting on the felt lined cover would have spread the mess and made matters worse. The next morning, I tried to clean a portion with some mineral spirits I had. It was a lot of work to remove a small amount and the cleaner also removed the wax. We decided to tackle the Highway without using the cover. Amazingly this section, while still having numerous frost heaves, was in fairly good condition. Some small gravelled construction areas, some where we followed a slow moving Pilot Vehicle along with a number of other vehicles through the construction. By the end of the day, we arrived in Haines Junction and stayed for that night and the next day in a Yukon Provincial Park. The next day I tackled the car, with an organic cleaning solution called Goof Off2 which I had bought a number of years ago to remove some paint that had been sprayed from a paintball gun on the side of one of our other RVs. After a day of slow, methodical cleaning, we had a white car again. 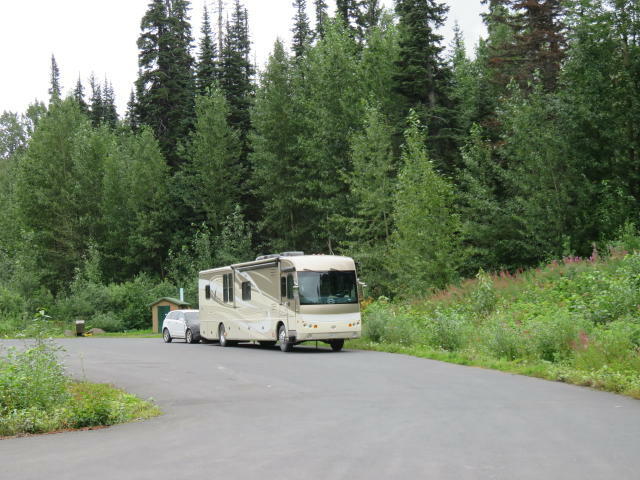 The next day, we put the cover on and drove to Whitehorse where we had the Check Engine light issue diagnosed, the chassis lubricated and the windshield damage repaired. With the longer days of summer, all of this work was done in one day whereas I had expected it to take 2 to 3 days. The next day we went back to the Whitehorse fish ladder and learned that just 15 fish had cleared the ladder so far this season. We had arrived back earlier than the salmon swimming upstream from the Kenai Peninsula. In another week, they would be much more likely to be there. We restocked up on food, fueled up and headed over to Watson Lake and down the Cassier Highway. We just pulled onto the Cassier and found a small pullout on a lake where we spent the night. The Cassier Highway runs down the glacial valley between the Coast Mountains and the Cassier and Skeena Mountain ranges. This is a beautiful trip with wide plateaus, soaring glacial peaks, lakes, and glacier fed rivers, some with rapids. We had been told that large sections of the highway were under construction, so we were apprehensive. Fortunately, the vast majority of the construction had been completed and we drove on new pavement for many miles. Weeks earlier it would have been a dusty, gravel mess. 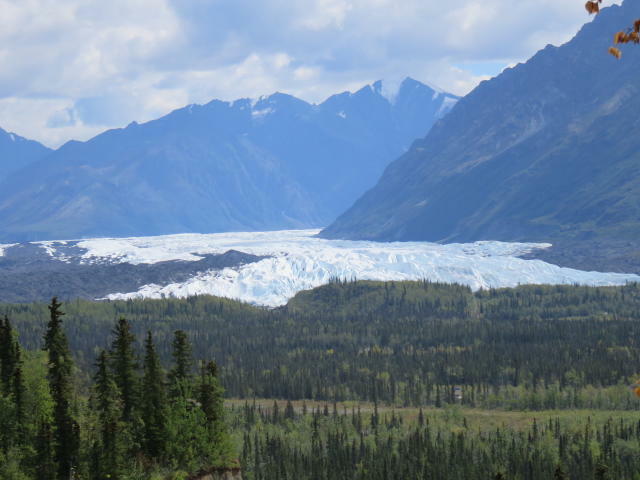 Slide 1 shows a wide glacier field on the Cassier and if you look at the mountain tops in the distance you will see glaciers on them. Slides 2 and 3 show the contrast with multi-colour mountaintops. 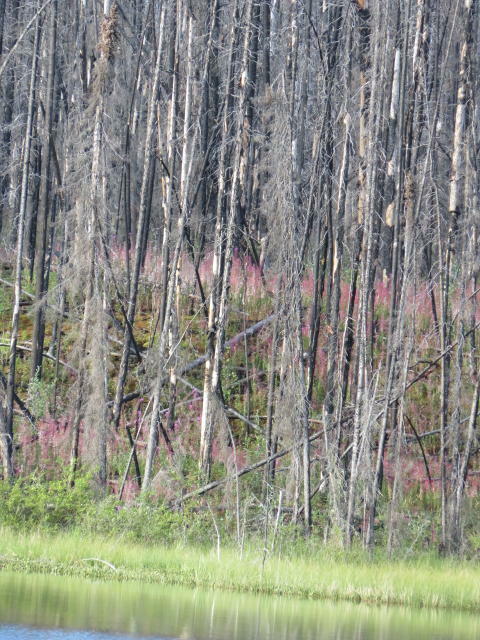 Slide 4 & 5 show pictures of fireweed growing in a forest destroyed by a wildfire. 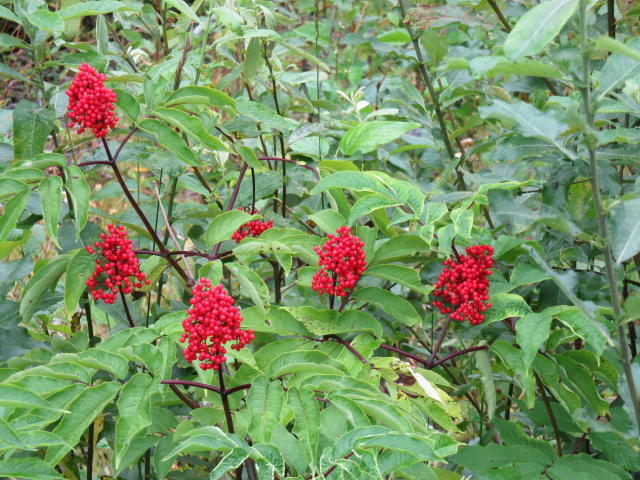 This ‘weed’ gets its name from the fact that it is the most prevalent first new growth in a forest devastated by a fire. 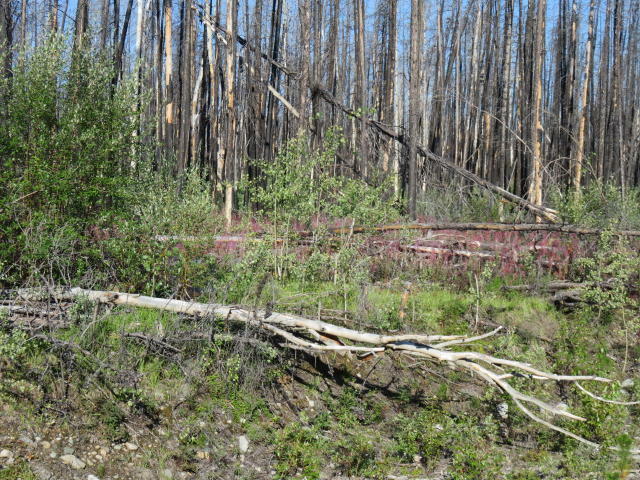 This particular forest fire destroyed over 30,000 hectares (74,000 acres) in 2012 and went on for miles on both sides of the Cassier. At first you feel sad that this much forest was destroyed, then with the sight of these wildflowers and other new growth there is hope and regeneration. We’ll show more later on. 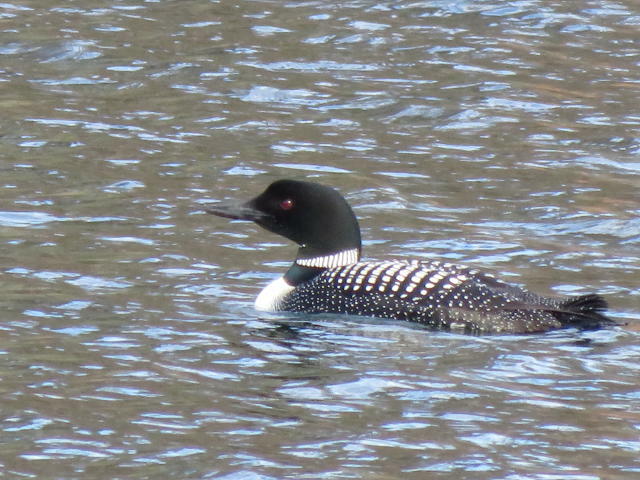 Slide 6 capture a loon in one of the lakes contained by this forest and it reminded us of one crafted out of wood by a friend. From the other side of the lake he watched us and this photo is only one of a series we took that morning. 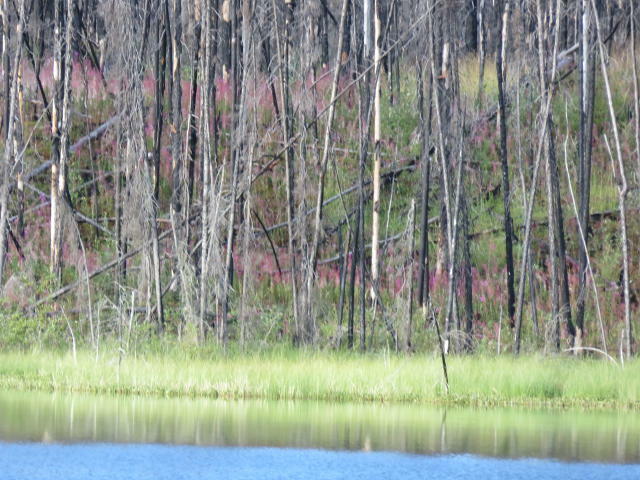 Slide 7 and 8 capture the contrast between the burned out forest and the new growth with fireweed blooming in the forest. As we drove, we noticed green-toned rock outcroppings where the highway wound its way through the valley. 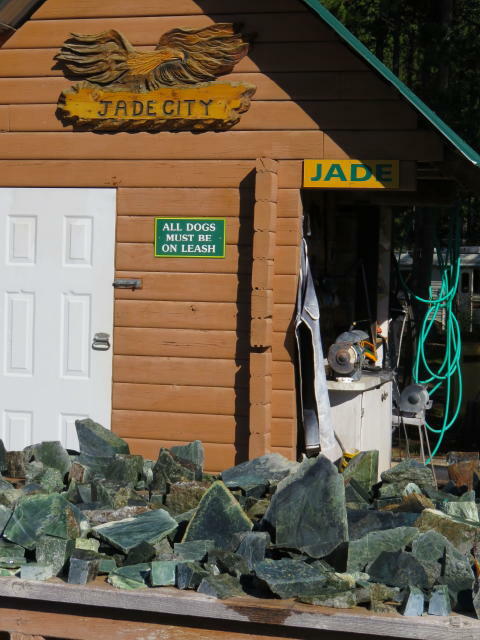 We came to a wide area with lots of buildings and obvious tourist type attractions called Jade City. 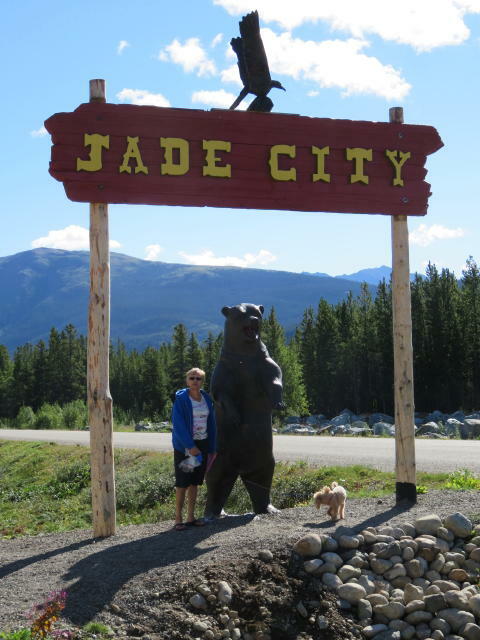 Of course we stopped and Jane (with Cassi) are pictured (in Slide 9) under the sign posing by a large carved bear. Large tables of Jade mined locally were set out for you to examine and after it was wetted with water, the true features of the rock were highlighted (Slide 10). We always thought that Jade stone came from the Far East. We learned that much of the Jade from this mine is shipped to the Far East. We saw men cutting the stone as they tried to accentuate the natural "grain” of the rock along with others who polished it on machines and by hand. We were able to ask the workers questions and learned a lot about the local industry and the skill gained by these craftsmen. They enjoyed their work. 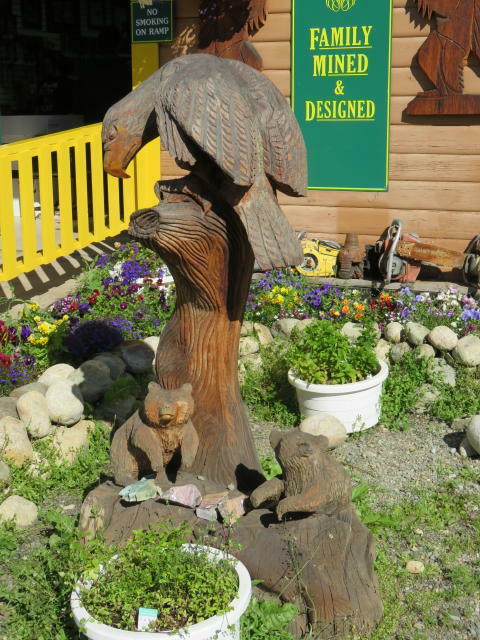 Slide 11 shows a carving just outside the door of the gift shop. 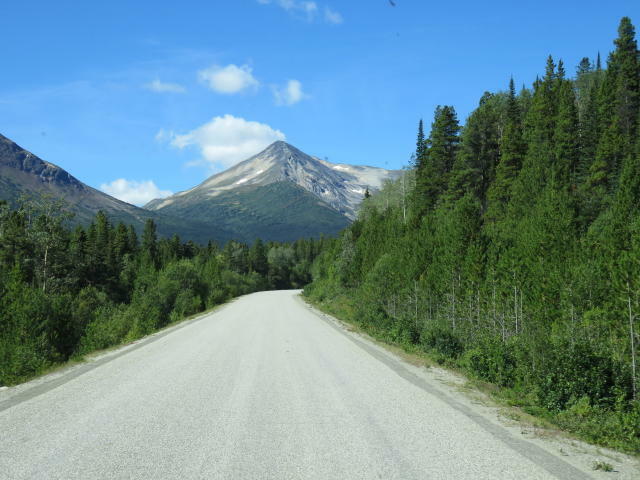 As we traveled further along the highway we captured a photo (Slide 12) of a Jade green topped mountain with Jade outcroppings which was straight ahead of us. 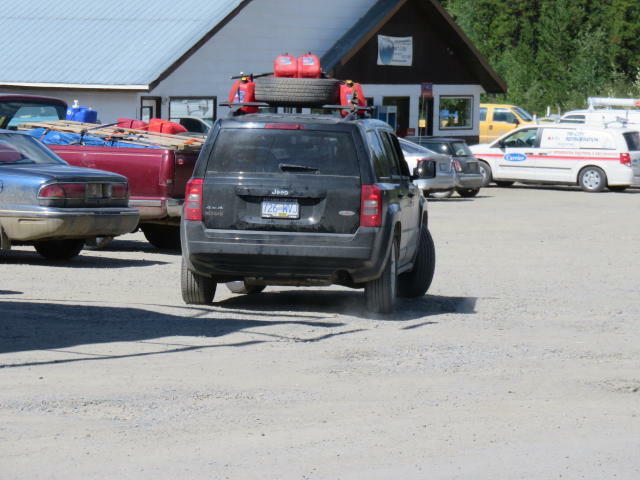 We stopped for lunch and fuel and I took a picture of a Jeep that had red plastic gas cans and another spare tire on the roof (Slide 13). This picture was duplicated hundreds of times during our northern trek and it really points out the misinformation people have about Alaska, the Yukon and Northern BC. Rumours abound about the lack of services and fuel. We never found that to be true, and we could not get over the increased danger people subjected themselves to both in carrying these containers and also filling them in place rather than placing them safely on the ground to eliminating static electricity from sparking a fire. In a word it is CRAZY! 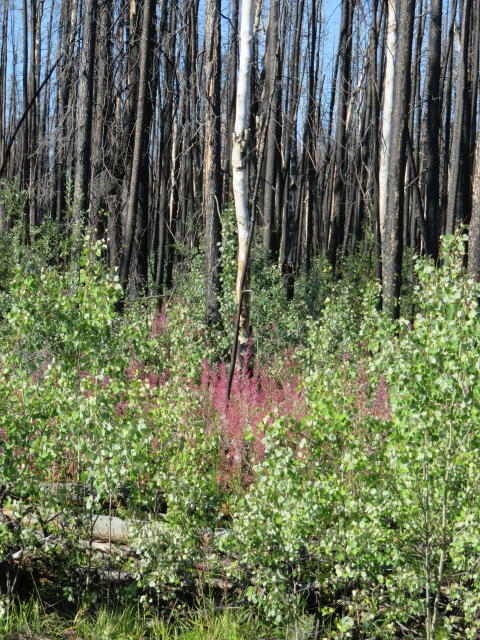 As we drove through areas where forest fires had occurred, we saw the lush new growth and berries that predominated the edges of the highway and into the edge of the forest. Slides 14-17 show that we weren’t the only living being to note this new growth. 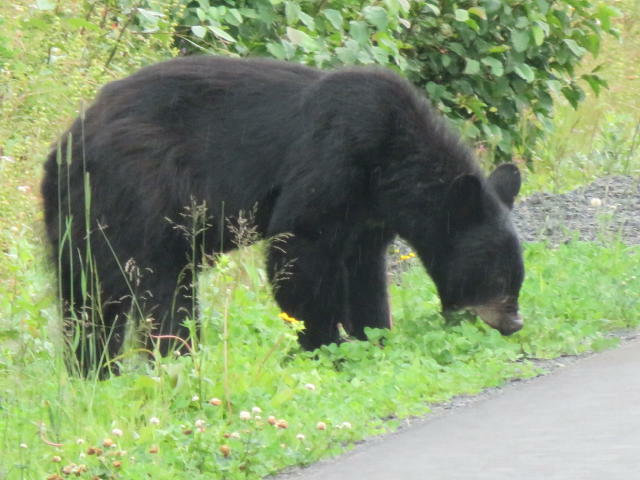 Large black bears enjoyed the various plants and berries and gave us an opportunity to see them up close. I won’t say we could touch them however we were not that far away and with a telephoto lens we could get "up close” photos. 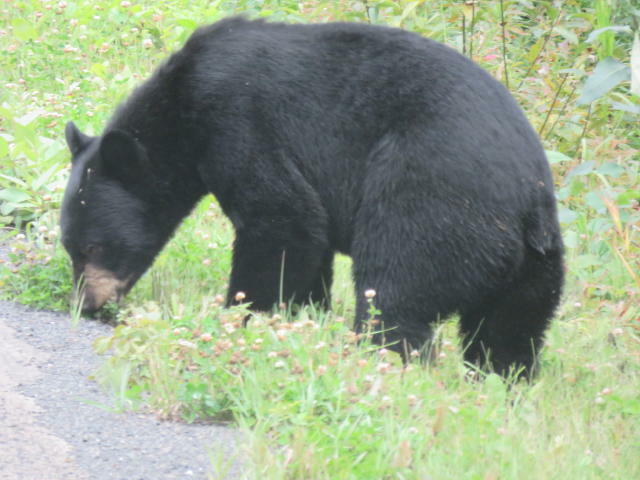 Thankfully, the bears would run off when we invaded their space, keeping them and us safe. We spotted a number nearer the end of the day and it provided a lift to our spirits. Slide 18 shows some of the berries similar to those along the road side that we saw at our evening and overnight rest stop shown in Slide 19. Slide 20 shows our view across the road in the morning.